The Tool menu in the Control Panel includes all the tools that are available in Insight for users to process and obtain additional information. Opening these tools will display a separate window unique to the operation. In the Control Panel, open the Tool menu. Mistie Overview Table — This allows you to view the mistie summary after performing manual or automatic mistie corrections (see Viewing Mistie Summary). Mistie Correction - Automatic — This will open the mistie correction wizard that allows you to automatically correct data misties (see Automatic Mistie Corrections). Synthetics — This will open the Synthetics application (see Using the Synthetics Window). Synthetics Analysis Table — This table displays the analysis of synthetics misties of the wells (see Statistical Analysis of Synthetics). Predict — This window allows users to display well log curves while configuring synthetics and applying filters (see Using the Predict Window). Predict Analysis Table — This table measures and displays the results of the cross correlation, mis fit or signal to noise ratio of wells. 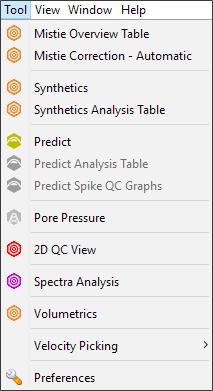 Predict Spike QC Graphs — This window generates and displays the spike QC pair and multi graphs. Pore Pressure — This module allows you to perform interactive geopressure analysis, calibration and prediction at wells and in 3D (see Pore Pressure Prediction: Module Summary). Spectra Analysis — This allows you to view and compare the spectra of volume traces and wavelets (see Spectra Analysis — Overview). Volumetrics — This will open the Volumetrics wizard to calculate the volume of a structure defined by a top or a top plus a base (see Using the Volumetrics Wizard). Velocity Picking — Select the velocity picks that you have created. The Velocity Picking window will be displayed (see Velocity Picking). Preferences — This allows you to set the preferred display units, internet settings, crosshair size and colour, and mouse sensitivity (see Preferences).